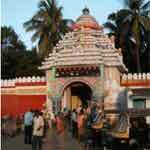 Abode of Lord Jagannath, literally Lord of the World, Puri is one of the four holiest places in India. Located on the shores of Bay of Bengal, it is one of the finest beaches in India. This pilgrimage town is also the home of artisans and craftsmen who produce a wide range of unique handicrafts. The reigning deity of the city, Lord Jagannath,whose temple was built way back in the 12 century is not only of great religious significance for the people of odisha but revered by thousands of pilgrims from all over the country. The important feature of Puri is its beautiful beaches which have offered both pleasures to pilgrims and swimmers for centuries. It is one of the most delightful beaches in the country and is becoming a pleasure haunt for tourists from all over the globe. Puri during the times of ancient days was also referred by the Charitra.Puri was initially part of the Kalinga kingdom and was inhabited by a group of tribal people know as the Sabaras who belonged to the pre-Aryan and pre-Dravidian Austric linguistic group. It is also known as Purusottama Kshetra after the construction of the Purusottama Jagannath temple by Raja Ananta Varman Chodaganga Dev in 12th century. The presiding deity of this temple was Lord Purusottama.During this period the town also became an important centre for Vaisnavism.In 1558 odisha was conquered by the Afghan Nawab of Bengal, who was defeated by Raja Mansingh,a General of the Mughal King Akbar who brought odisha under the Mughal territory.Puri remained as odisha's capital till it was captured by the British in 1803.The Raja of Khurda rebelled in 1804, and there was a peasant uprising in 1817-18.There was a major tragedy in 1866 because of the odisha famine which claimed many lives in Puri. Puri is located on the eastern coast of odisha with the Bay of Bengal and the rice-growing alluvial plain on its east, Khurda district on its west, Sambalpur on its south and the state capital Bhubaneshwar on its northern side. The festival of chariot known as Rath yatra,an annual ritual spreading over the entire summer and monsoon months makes Puri attractive and enjoyable for tourists.Jagannath's chariot is a 35 feet square rising to a height of 45 feet and is supported on 16 wheels. The cart is covered with brightly coloured yellow and red fabric with a wheel on top of it. The Hindu New Year beginning in mid-April heralds the summer and is the season for the famous Chandan Yatra at Puri. The Chalanthi Prathimas or moving images of the deities take a ritual boat ride after a refreshing bath in the fragrant sandal wood scented water.Snana Yatra, the festival of bath, in which the main images are installed on bathing platforms and given a ceremonial bath, follows this. Then comes the annual journey of the three deities on grand chariots to their garden house. During the Anavasara festival, it is said that Lord Jagannath suffers from fever and hence an infusion of medicines is offered in the form of soups and fruit juices. The main temple, a majestic structure of about 65 meters high, stands on an elevated platform in the heart of the city-its swirling pinnacle commanding the landscape for miles around. It is a monument of the 12th century AD built by Chodaganga Dev with all the richness and plasticity of the Kalinga style of architecture. Entry to this temple is restricted to the Hindus only. The temple kitchen is said to be the biggest in the world feeding thousands of devotees daily with mahaprasadha.In the Garhagriha or sanctum there are strange archiac type of wooden images of Sri Jagannath, his sister Subhadra and brother Balbhadra. 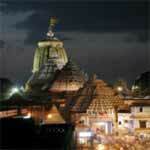 Gundicha Mandir is one of the temples closely related to the festivity of the Rath Yatra of Puri. It is a holy place where God resides for seven days during the festival. This garden is regarded as the place of lord Jagannath's aunt. Sakshi Gopal is situated at s distance of about 20 km away from Puri.There is a life size image of child Krishna. The story behind this place is that when Lord Krishna came to this place as a witness to clear out a dispute of two Brahmans, liked the place very much and decided to stay here for a while. Puri offers tourists the rare opportunity of witnessing the colourful sunrise and sunset on the same beach where they can bathe and laze for hours on the golden sands. One can also see and enjoy traditional fishermen in hundreds, playing their catamarans or sail boats and drawing into their nets rich catches of prawn, pomfret and other fish on this long and wide beach extending for miles. This is a famous picnic spot in Puri located at a distance of about 8kms from the town at the mouth of the river Nuanai.The Balighai Beach is noted for its causarina trees. There is also sea turtle research center here. Konark Sun Temple is located at a distance of about 35kms away fro Puri amidst sand dunes of the Bay and the palm casurina plantations is a sublime monument. This temple is sheer poetry in stones conceived and executed as a Colossal Sun Chariot with 12 pairs of ornate wheels and hauled by 7 raring spirited horses this pagoda is an everlasting testimony of the speculative and aesthetic sensibilities of a race that knew how to live, love, fulfil, sublimate and create. Puri.The Lake is considered as an important wildlife habitat. Chilka sanctuary is home to more than 150 species of migratory as well as resident birds. The grand road as it is called is ideal for a leisurely stroll and shopping for souvenirs and momentoes.Typical Puri handicrafts includes miniature stone sculptures, wood carvings, sea shell items,patta -paintings on cloth canvas and colourful applique work. One can pick up these pieces from Art and Craft complex at Mochisahi,Sudarshan crafts museum at Station road, Sun Crafts at Police Line,Utkalika at Grand Road and Sea beach, Crafts development centre at Batagaon or from shops at the southern end of the beach at swargadwar,gateway to heaven. 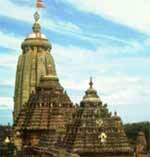 The nearest airport to Puri is in Bhubaneswar which is situated at a distance of around 56 Km. Indian Airlines and all major private airlines have regular flights to and from Puri. It receives flights from all important cities of India like Delhi, Mumbai, Kolkata, Bangalore and Chennai. From the airport, there is regular bus service to Puri. You can also hire a taxi. Puri has its own railhead which is one of the most important stations in East India. It has connections from all major cities of India. The station is situated close to the heart of the city and is accessible from all corners of the city. Puri has good road network and is connected to all the major cities of odisha. 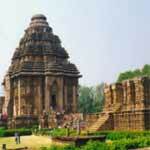 Bhubaneswar, the capital of odisha is just 56 Km from Puri. State transport buses ply to and from all parts of the state.